Though in recent years the religious right has been a powerful political force, making "religion" and "conservatism" synonymous in the minds of many, the United States has always had an active, vibrant, and influential religious Left. In every period of our history, people of faith have envisioned a society of peace and justice, and their tireless efforts have made an indelible mark on our nation's history. 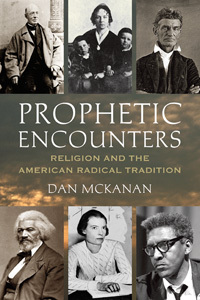 In Prophetic Encounters, Dan McKanan challenges simple distinctions between "religious" and "secular" activism, showing that religious beliefs and practices have been integral to every movement promoting liberty, equality, and solidarity. From Frederick Douglass, John Brown, and Elizabeth Cady Stanton in the nineteenth century to Dorothy Day, Martin Luther King Jr., and Starhawk in the twentieth, American radicals have maintained a deep faith in the human capacity to transform the world. This radical faith has always been intertwined with the religious practices of Christians and Jews, pagans and Buddhists, orthodox believers and humanist heretics. Their vision and energies powered the social movements that have defined America's progress: the abolition of slavery, feminism, the New Deal, civil rights, and others. A similar hunger for encounter brought several feminists together in a California storefront in the 1970s. They had already had their consciousness raised, but they yearned to tap more deeply into the woman-power that, they believed, had inspired ancient worship of the goddess and the medieval healing practices that were stigmatized as witchcraft. Their conversation about magic became a ritual, as the women “took hands, and started breathing together.” Realizing that “a circle had been cast,” they anointed themselves, kissed, and began chanting the names of ancient goddesses, entreating them to “pour out your light and your radiance upon us. . . . Shine! Shine! Shine!” As the energy subsided, they chose a coven name, Compost, thus reassuring themselves that “whatever magic brings, it will not take away our ability to laugh at ourselves.” They also realized that magic could empower them to change the world. Coven leader Starhawk introduced their Spiral Dance at a massive demonstration against a nuclear power plant, and soon pagan-inspired rituals were an integral part of direct action campaigns against war, environmental destruction, and globalization. To say that radicalism is almost a form of religion is not to deny the tension between the two but to explain it. Radicals seek to live in relation to a better world that might exist here on earth in the future; most conventionally religious people orient their lives to realities beyond this world. While radicals achieve empowered identities through interpersonal encounters, most religions offer a new identity through encounter with spiritual beings. (The major exception, religious humanism, has rarely clashed with the Left.) As a result, the relationship between the Left and conventional religiosity has the volatility of sibling rivalry. Some radicals find their religious and radical commitments to be mutually reinforcing; others come to see their cause as the true church. Many American leftists have, from time to time, found themselves in both of these postures. The tensions run deep and should not be dismissed as a matter of secularist prejudice.